A Phillipines beach resort has publically criticised “self-proclaimed” Instagram influencers of being freeloaders. “We are receiving many messages regarding collaborations with influencers, Instagram influencers. 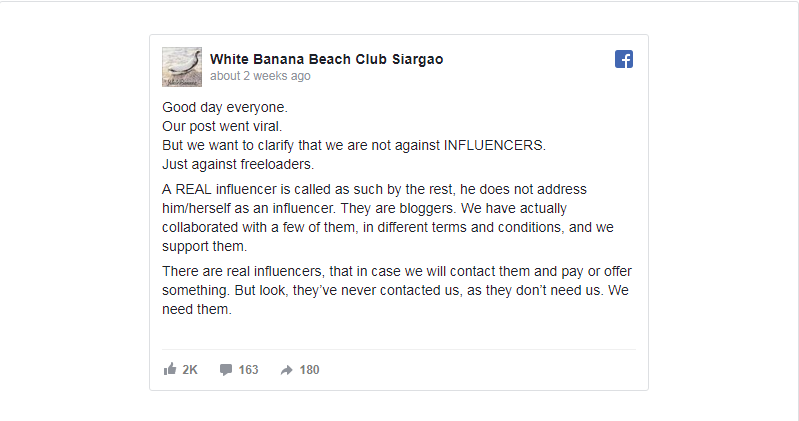 We kindly would like to announce that White Banana is not interested to ‘collaborate’ with self-proclaimed ‘influencers’,” the White Banana Beach Club Siargao said in a Facebook post that has since gone viral. “And we would like to suggest to try another way to eat, drink, or sleep for free. Or try to actually work,” the post concluded. At writing the post has garnered several thousand likes, with comments both in favour and against the resorts public condemnation of influencers approaching the resort for free stays. “As someone who works in marketing and also manages a small resort, I can attest to the fact that the big influencers don’t ask for freebies. They ask for permission to film and take photos but they usually offer to pay (or send a business proposal instead of asking for free things) … We must not excuse nor defend the entitlement of self-proclaimed influencers,” one Facebook user commented. Other users were unhappy with the resort’s stance, stating that it would have been more professional for the White Banana to decline requests in private rather than going public with an unnecessarily condescending post. “A REAL influencer is called as such by the rest, he does not address him/herself as an influencer. They are bloggers. We have actually collaborated with a few of them, in different terms and conditions, and we support them,” the post read. The resort has since said that it is attracting bad reviews, from people it claims have not visited the resort. “Take a look! Sweet snowflakes that probably never worked a day in their life,” the resort said after releasing its latest cocktails “The Snowflake” and “The Influencer”.